From roses to orchids, the rainforest to the Mid-Atlantic, rare and endangered plants to the latest in home gardens, you will find a world of plants and environments in our permanent exhibits and gardens. Any time of year, you'll see something beautiful in bloom at the U.S. Botanic Garden Conservatory, the National Garden, and Bartholdi Park. The indoor gardens and galleries of our Conservatory, with the jungle, desert and primeval paradise, offer the perfect foil to a winter day or harried schedule. The resplendent diversity of form, color, fruit, and fragrance reminds us that plants make our lives possible and enjoyable. 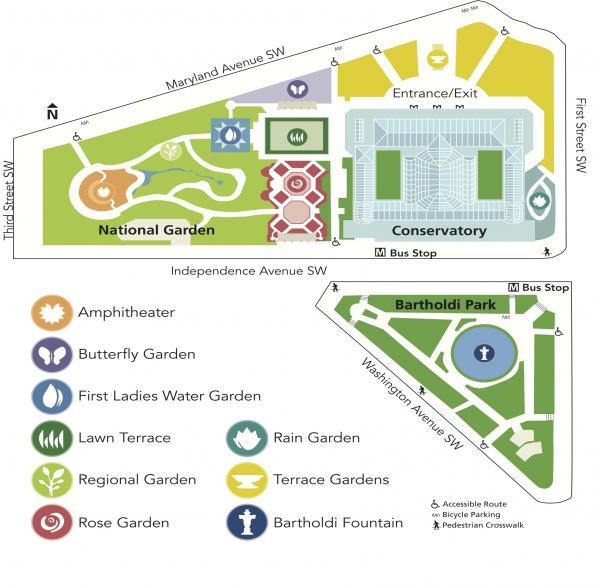 Outdoors, our National Garden offers the finest of Mid-Atlantic plants and Bartholdi Park just across Independence Avenue demonstrates a variety of approaches to the home landscape.